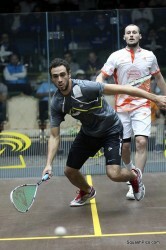 Egypt’s 21-year-old Mohamed El Shorbagy – the youngest player in the world top 25 – upset fourth-seeded compatriot Karim Darwish in today’s quarter-finals of the Qatar PSA World Squash Championship in Doha to reach the semi-finals of the premier PSA World Tour championship for the first time. Boasting a $325,000 prize-fund, the second biggest in the sport’s history, the Qatar PSA World Championship is being hosted by Qatar for the third time – following previous stagings in 1998 and 2004 – and being held at the Khalifa International Tennis & Squash Complex. After his sensational 11-9, 12-10, 11-9 upset over the former world number one, El Shorbagy “fell to the floor and lay there prone as the cheers washed over him,” added Edwards. Interviewed by Edwards after the match, the world No6 from Alexandria said how much respect he had for 31-year-old Darwish, who had encouraged him as a youngster coming into the game by spending time on court with him. The eighth-seeded underdog now faces top seed James Willstrop for a place in the final. 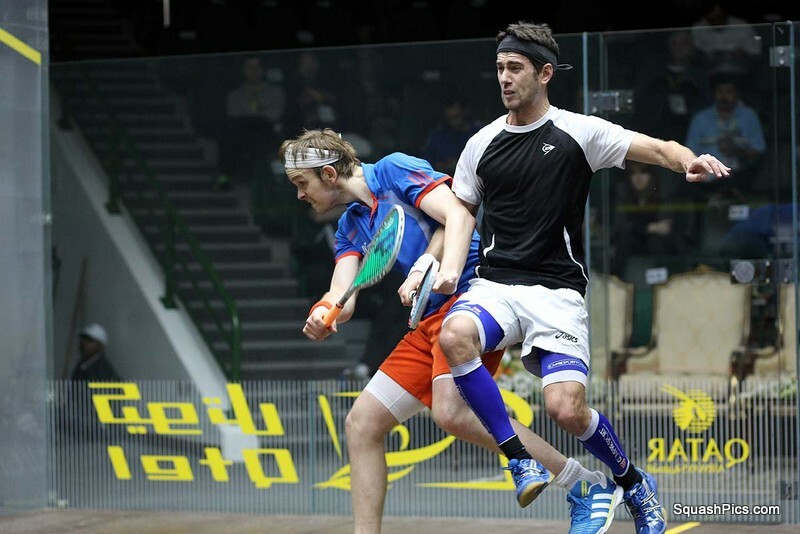 The world number one from England, bidding to win the crown for the first time, ended Spaniard Borja Golan‘s run – beating the surprise quarter-finalist from Santiago de Compostela 11-7, 11-7, 11-5 in 65 minutes. “We clashed out there,” admitted the 29-year-old from Leeds later. “It wasn’t pretty and not the best match to be involved in. People have had recent issues with movement but I’m not meaning to block. Sometimes squash brings out these issues. Golan, who had become the first Spaniard for 20 years to reach the world quarter-finals, added: “I was playing the world number one. I tried one hundred per cent on each point, but today he was better than me. 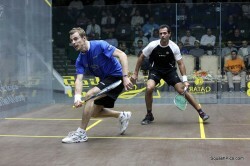 “But this is the best I have done in my career, and I am pleased about that,” concluded the world No13. The other semi-final will also be an Anglo/Egyptian clash – between England’s defending champion Nick Matthew and 2008 champion Ramy Ashour. Fifth seed Ashour overcame French rival Gregory Gaultier, the No3 seed, 12-10, 10-12, 11-6, 9-11, 11-3 in an exhilarating 92-minute encounter in which the Egyptian saved five game-balls in the first game and Gaultier saved five in the second! In the final match of the day Matthew, the world number two from England bidding to become the first player since Pakistan legend Jansher Khan to win the world title three times in a row, faced illustrious Egyptian Amr Shabana, a four-time winner of the trophy. 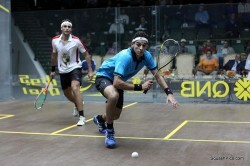 It was the pair’s 21st PSA Tour match over the past 11 years, with the head-to-head poised at 11-9 in the Englishman’s favour before they went on court. It took more than an hour for Matthew to extend the record, winning 11-5, 9-11, 11-5, 11-4 in 64 minutes to reach his fourth semi-final since 2007.